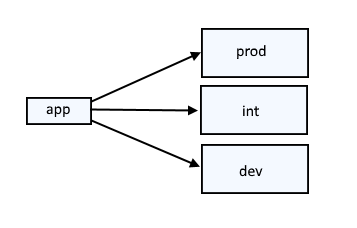 To understand how variables work in WebSphere, let's consider a scenario where an application will be deployed to a few different WebSphere servers, where one WebSphere server is using for development (dev), one is used for integration testing (int), and one is used for production (prod). If the app has markup that is environment specific, this creates challenges and introduces risk, as the markup of the application would need to be modified for each environment. For example, the below markup includes "dev" for the development environment. Instead of putting environment specific markup in the app, WebSphere variables can be used. It is also noteworthy that a properties file could be used, but it usually does not make much sense to use a properties file, since WebSphere can take care of this using variables. Additionally, less markup is needed in the Java app when using WebSphere variables. There are a couple different places you can create variables in WebSphere. They can be created at Environment > WebSphere variables or at Servers > Server Types > WebSphere application servers > your JVM > Java and Process Management > process definition > Java Virtual Machines > Custom properties. For this scenario, where an application needs to use the variable, the variable will be created at Servers > Server Types > WebSphere application servers > your JVM > Java and Process Management > process definition > Java Virtual Machines > Custom properties. In the left panel of the WebSphere admin console, select Servers > Server Types > WebSphere application servers. Select the JVM that contains the app. Create the name and value of the variable and select OK. In this example, a variable named ENV with a vaule of "dev" was created. In this example, a class named "Environment" contains the following markup. This class creates a variable named env, and the env variable gets the value of the ENV variable from WebSphere. You can now use the env variable in the class. One option would be to use the following markup, which would allow you to use the env variable in a JSP page. Another option would be to use the env varialbe in the class. If you are going to be passing the env variable onto a JSP page, in the JSP page, you would import "com.sample.main.Environment". Then, create a new object (foo in this example). In Environment foo = new Environment();. The text "Environment" must be used since the class is named "Environment". Using foo, get the value of the env variable. Be careful to use "out.print" and not "out.println". Now, once the app has been deployed to WebSphere, the environment should be displayed.